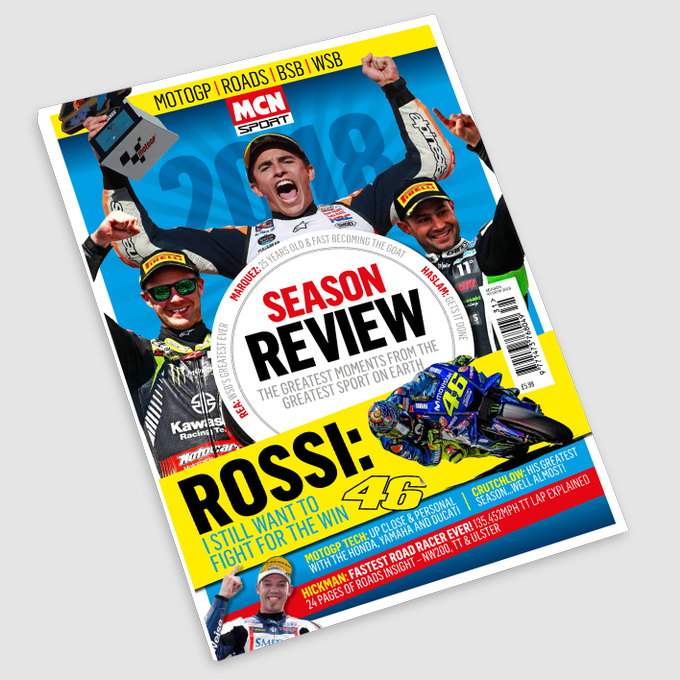 ﻿ 2018 MCN Sport Season Review on sale now! 2018 MCN Sport Season Review on sale now! The 2018 MCN Sport Season review is in shops now! The glossy 132-page magazine takes a look back at yet another brilliant year of racing, including MotoGP, World Superbikes, British Superbikes, road racing and more. Featuring stunning photography by some of bike sport’s leading snappers and words from MCN’s team of contributors, the Season Review takes you through each of the world’s biggest race series with full round-by-round analysis from people on the ground at each event. There are exclusive interviews with some of racing’s biggest stars, including seven-time Grand Prix World Champion Marc Marquez, World Superbike’s most successful rider of all time Jonathan Rea, British Superbike Champion Leon Haslam and the Isle of Man’s 135mph lap star, Peter Hickman. Find out all the tech secrets about the top GP machinery including Repsol Honda’s RC213V, the Yamaha YZR-M1 and Ducati’s Desmosedici GP. Nine-time World Champion Valentino Rossi tells MCN Sport how he thinks he can continue at the sharp end in 2019, while British Superbike king Shane Byrne admits he doesn’t know what the future is going to hold after the devastating neck injury he sustained this year. Britain’s Cal Crutchlow also talks about one of his most successful Grand Prix campaigns to date. Dani Pedrosa talks retirement, Bradley Smith and Scott Redding discuss the future as they move away from the Grand Prix paddock and we go trials riding with Carl Fogarty and James Whitham. MCN Sport Season Review 2018 is out now in WHSmiths and all good newsagents or you can order direct from us and get free UK p&p. BSB: 'Seeing Red' season review now on sale!